and holding a pair of binoculars. Courtesy of the Vancouver Public Library. 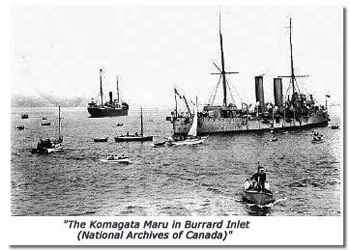 On May 23, 1914, a ship called the Komagata Maru, arrived at Vancouver and anchored in Burrard Inlet. She was chartered by Gurdit Singh and carried 376 Indians: 12 Hindus, 24 Muslims and 340 Sikhs, British subjects all who had come to make a new life in Canada. There was already deep seated prejudice against non-white residents in the area. Anti-Oriental riots had occurred as recently as 1907. Responding to these public pressures, Canada had passed highly restrictive immigration laws and after 1907 immigration from India slowed to a trickle; 2623 Indians entered Canada in 1907, while in 1908 only 6 were admitted. Word of the ship’s approach had already reached Canada and newspapers had picked up the story. 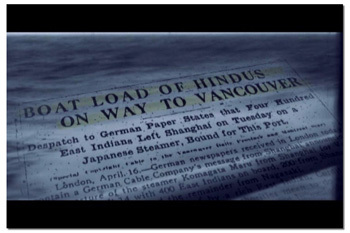 The Province newspaper headlined its report “Boat Load of Hindus on Way to Vancouver.” Other headlines referred to a “Hindu Invasion” The arrival of the Komagata Maru was a direct challenge to the Canadian exclusionist laws – any immigrant desirous of entering Canada must come via direct passage from India and must have $200 on their person to enter British Columbia. The Indians argued that as British subjects they should have the right to immigrate to any country in the British Empire. The ship remained docked in Vancouver harbor for two months. 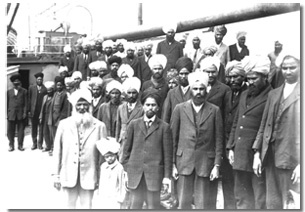 A shore committee led by: Bhag Singh, Hussain Rahim, Dalip Singh & Balwant Singh collected thousands of dollars from the local Indians, to provide food and aid for the men, women and children aboard the ship. They also waged a legal battle with their counsel J. Edward Bird. But the exclusionist carried the day, and provincial authorities in British Columbia finally ordered the ship to leave Canadian waters. 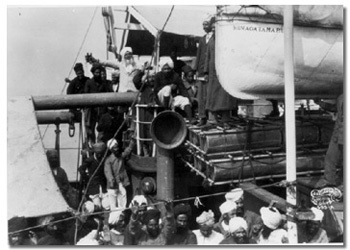 The Komagata Maru departed from Vancouver on 23rd July 1914. 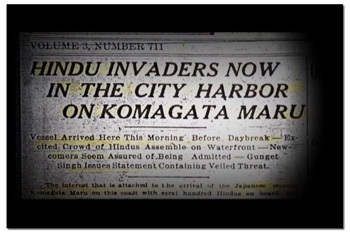 The Komagata Maru story had not yet ended. On September 26, 1914 the ship, with its passengers now having been on board for a miserable four months docked at Budge-Budge, near Calcutta. British authorities expected to find the passengers disillusioned with Gurdit Singh, who had led them on the unsuccessful venture. Instead they found a group of embittered nationalists, loyal to him and furious with the British government. The authorities tried to force all the passengers to depart immediately for Punjab by waiting freight train and in the violent confrontation that followed, 20 twenty passengers were killed and 9 were wounded and many were imprisoned, including Gurdit Singh. 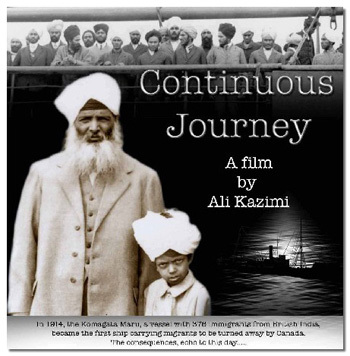 Canadian director Ali Kazmi has made a film, the “Continuous Journey” documenting this historic event. It is a complex tale of hope, despair, treachery and tragedy. It is a revealing Canadian story with global ramifications set in a time when the British Empire seemed omnipresent and its subjects were restless and seeking self-determination. Another Indo-Canadian director Deepa Mehta is planning a big budget feature film about the Komagata Maru tragedy with the lead been played by the high profile Indian actor, Amitabh Bachan as Gurdit Singh and British actor Terence Stamp in the crucial role of the lawyer Edward Bird.